This is a cream that comes in a small package and is targeted primarily towards children, but says that it can also work on any member of the family. Any product that says it works on babies’ skin and also works on skin of adults, you should be wary of. 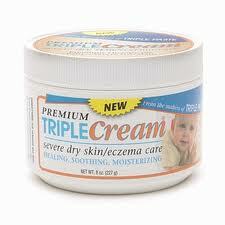 Most people that have used it say that it is great for their baby’s case of eczema but does nothing for adult cases. Comes with more than half a pound of product. The product is a thick cream that is applied directly to the skin and works to cure all of the symptoms of eczema, itching, burning, and dryness. This product, as stated above, is good for children. At least visibly, parents should be able to tell that the itching, swelling, burning all goes away. It works on children under two and also works on children that have considerably advanced in age. However, because a child’s skin is so different from an adult’s it does not work well on adults even though it claims that it does. The consistency is simply too thick and greasy for it not to make a mess. This is a perfect consistency for children because their smooth skin can handle this, but adult skin is more rugged, and such a flimsy cream has trouble penetrating to the affected zones in an adult’s skin.